A future center for creativity, collaboration and education in an historic industrial building. Thank you to everyone who attended last week's Foundry Advisory Committee meeting and shared feedback. During the meeting architects Cambridge Seven gave an overview of of the latest draft building designs, we heard about the great progress that the Foundry Consortium is making in conducting community outreach around programming, and we took a tour of The Link, which is brand new in Kendall Square. There may be connections between The Link and the Foundry in the future, as The Link is now home to nonprofit workforce development programs focused on the innovation economy. If you missed the meeting and wish you had seen the building designs, don't worry...there will be a community meeting in late spring on building design, when we will also keep collecting feedback on programming. Please continue to share your feedback and questions in the comments section. The next Foundry Advisory Committee meeting is scheduled for Friday, July 12th. And we'll keep you posted on other activities in the meanwhile. Until then, enjoy the spring (ish) weather! PS: Don't forget that the City Manager is still seeking applicants to fill two seats on the Foundry Advisory Committee. The deadline to apply is April 26th. You can apply online or pick up an application from the City Manager's office in City Hall, 795 Mass Ave.
Seeking Applications For Foundry Advisory Committee! We have two vacancies coming up on the Foundry Advisory Committee -- and could use your help to identify great new additions for this group! You do not need prior experience on a City committee to be a valuable asset on this committee. The City Manager's office is running this process, and the CRA will be represented on the selection committee. See the notice below, which has all the details, including the application deadline of April 26th, and the link to apply: cambridgema.gov/apply . You can also pick up an application from the City Manager's office at City Hall. Cambridge, MA, March 20, 2019 -- Cambridge City Manager Louis A. DePasquale is seeking volunteers to serve on the Foundry Advisory Committee. 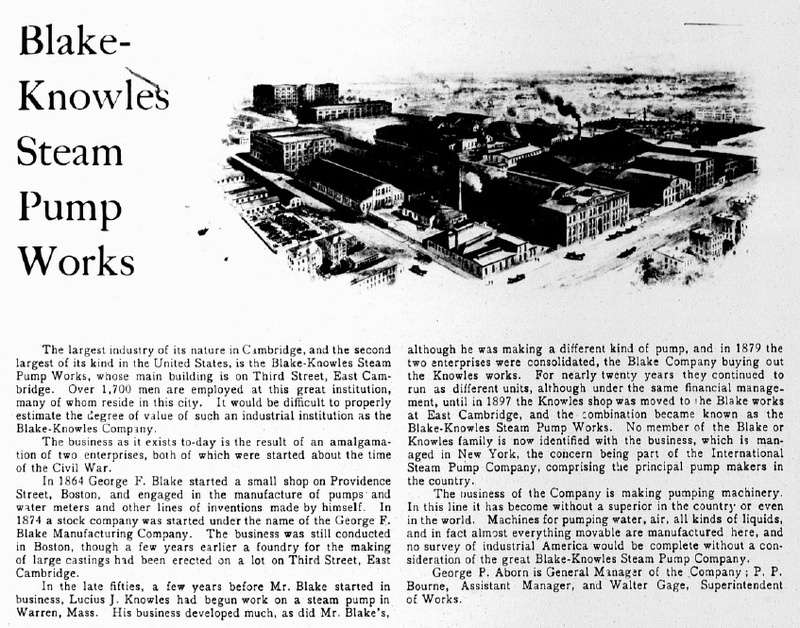 The Committee is made up of community members who serve in an advisory capacity to the City of Cambridge and the Cambridge Redevelopment Authority (CRA), to help ensure that the Foundry building’s (101 Rogers Street) redevelopment and ongoing operation remains consistent with the Vision and Objectives established in the Demonstration Plan. The deadline for submitting applications is Friday, Apr. 26, 2019. Applications can be submitted to City Manager Louis A. DePasquale using the City’s online application system at cambridgema.gov/apply. A cover letter and resume, or applicable experience, can be submitted during the online application process. Paper applications are available in the City Manager’s Office at Cambridge City Hall, 795 Massachusetts Avenue. For more information, contact the City Manager's Office at 617-349-4300 or citymanager@cambridgema.gov. RE-RESCHEDULED to 2-26: First Chance To See Public Art Proposals! The snow date of Feb 20 conflicted with another important East Cambridge event. The 26th is the final date - please also note the new location. Tuesday, February 26th from 6 to 8 p.m.
Cambridge Police Department, 125 Sixth Street, Cambridge. The three finalists for the Foundry public art project—Elisa Hamilton, Innovators for Purpose and Masary Studios—will present their proposals. Then there will be a break-out session allowing members of the public to speak with the artists, review sketches of their designs, ask questions and give feedback. Two days after this meeting the selection committee will make the final selection of the artist or artist team to create a public artwork to be installed at the Foundry for everyone to enjoy. The public art project is funded by the City of Cambridge's Percent-for-Art ordinance, which requires that 1 percent of the construction costs on municipal capital investment projects be designated for use in developing site-responsive public artwork. Learn more about this project at the the Cambridge Arts Council Foundry page. RESCHEDULED to 2-20: First Chance To See Public Art Proposals! This event has been rescheduled due to today's forecast! Come to the rescheduled community meeting on Wednesday February 20th from 6 to 8 p.m., at the Cambridge Citywide Senior Center, 806 Massachusetts Ave.
On Feb. 28, the selection committee will make the final selection of the artist or artist team to create a public artwork to be installed at the Foundry for everyone to enjoy. Come to a community meeting on Tuesday, Feb. 12, from 6 to 8 p.m., at the Cambridge Citywide Senior Center, 806 Massachusetts Ave. The CRA is seeking a property management entity for the Foundry. If you know of firms that would be suitable to help maintain and manage this unique multi-use arts- and tech-focused community center, please share this information! The agenda will include updates on: the public art installation, the design and construction timeline, the future community engagement plan and an opening expected on the FAC. We will then focus time on the RFP for property management at the Foundry and developing principles for space utilization. Meet and mingle with artists who will develop proposals for public art at Cambridge’s Foundry building—Elisa Hamilton, Innovators for Purpose, and Masary Studios—on Tuesday, Dec. 11, at 5:30 p.m., at 500 Kendall St. (BioMed building) in the first floor café. Free. Let them know your vision for public art at the Foundry. Light refreshments will be served. The public art project is funded by the City of Cambridge's Percent-for-Art ordinance, which requires that 1 percent of the construction costs on municipal capital investment projects be designated for use in developing site-responsive public artwork. Programmatic Foundry Feedback – Please respond by 12/3! The CRA will wrap up its programmatic comment period for the Foundry on Monday, December 3rd, 2018, in order to ensure all input can be included in design discussions. We want to make sure your voice is heard, so let us know your ideas by responding to our questions in the comment section! There are two public art meetings scheduled for the Foundry. 1. The Foundry Consortium is holding a public meeting Monday, November 26th to review several concepts for how the Foundry space will be used (e.g., a mix of private studios and shared co-working spaces for artists). As time permits, and in future meetings, the Foundry Consortium will discuss arts programming including: the potential for artists-in-residence; ways to prioritize the use of space if the space is over-subscribed; and gathering new ideas about the community's needs and wants regarding the arts. Please contact Zoe Vanderschmidt, zoev@mit.edu, with any questions. 2. Save the Date! The Foundry Consortium is hosting a public meeting on Tuesday, December 11th to allow the community to meet the finalists selected for the City of Cambridge’s Call for Public Art RFQ, to create public art to be installed at the Foundry. More info to come. Where: 500 Kendall Street in the 1st Floor Café Space. The City and CRA have selected W.T. Rich (www.wtrich.com/) as the Construction Manager at Risk for the Foundry construction. As part of the 149a construction procedures, W.T. Rich will be brought on board to assist with the design of the building, initially to provide feedback on the Feasibility Study and Cost Estimate to be completed by Cambridge Seven by years end. The CRA and Lemelson-MIT are participating in design meetings to align the building program with the financial plan for the building’s operations. Thank you for your continued feedback. Stay tuned for further updates! Thank you for following the Foundry project and for those of you who have provided feedback! The design team and operator are busy working to include your initial comments into their work. As we move forward to the next stages of the project, we are excited to continue to hear your thoughts. Stay tuned for upcoming public meetings and further updates! coUrbanize Foundry Site is Back! The Foundry redevelopment project has continued to progress positively throughout this year. The City and CRA wish to re-engage the Community with the ongoing project by including updates, meeting agendas, and important project documents to the Foundry coUrbanize project site. As always you are welcome to ask questions and continue the dialogue that can assist in a successful project. Please join us tonight at the Foundry Community Meeting where you can meet the selected Designer and Building Operator. Please be advised of the upcoming CRA Board meeting regarding the Foundry redevelopment. The CRA Board is holding a public meeting this Wednesday to consider an amendment to the 50-year Lease with the City of Cambridge for the Foundry Building for the purposes of redevelopment the property consistent with the Foundry Building Demonstration Project Plan. Additional information regarding the redevelopment of the Foundry - its history, context, community proccess, building information and more - is available on the CRA Foundry website. On October 19, 2017 the City released the Request for Qualifications (RFQ) for Designer Services for the Foundry Building. The City is seeking proposals from qualified firms for design services for the renovation of the Foundry Building, consistent with the Amended Foundry Demonstration Project Plan. The CRA is preparing a Request for Proposals (RFP) for Building and Program Operator Services that will be released by the end of the year. The RFP is being drafted with the input that was received from the many submissions from the Building and Program Operator Request for Information which was released in late August 2017. Additional information regarding the Foundry project can be found on the updated CRA Foundry web page. Please be advised of the upcoming Cambridge City Council meeting regarding the Foundry redevelopment. 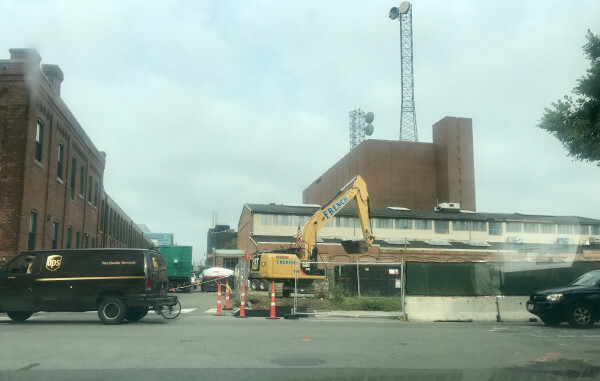 The Cambridge City Council is holding a public meeting this Monday to consider accepting an amendment to the Foundry Demonstration Project Plan. If approved, this amendment would enable the new project approach whereby the City and CRA together make the needed capital investments to the property, and the CRA seeks an Operator to maintain and program the building. Today's Council agenda can be viewed here. Please be advised all CRA Board meetings are open to the public. At the September 13, 2017 CRA Board public meeting the Board voted to approve the amendment to the Foundry Demonstration Plan and to recommend its approval by the Cambridge City Council later in the month. The site that abuts the Foundry Building to the east is currently an active development site. This project, which is located at 249 Third Street, is not part of the Foundry redevelopment project. The developer of 249 Third Street is EQR-249 Third St LLC. Formerly a surface parking lot, EQR-249 Third St LLC has proposed to construct a five-story residential building that will include 84-units as well as approximately 1,400 SF of ground floor retail space. The project is expected to complete in the Summer of 2019. Click here to find more information regarding the project. Below is a current picture of 249 Third Street construction site. The CRA Board is holding a public meeting this Wednesday to consider an amendment to the Foundry Demonstration Project Plan. The amendment would enable the new project approach whereby the City and CRA together make the needed capital investments to the property, and the CRA seeks an Operator to maintain and program the building. If approved by the CRA Board, the amendment will be considered by the City Council later in the month. Note: Responses to the RFI are due September 15! New questions have been added to the comment section of this site. The questions are a few of the key questions that are asked in the recently issued Request for Information. Please feel free to send us your feedback and any helpful information. The CRA is seeking information and ideas regarding the management and community programming of the Foundry building. The Request for Information (RFI) is available here. Who: Input from experienced creative professionals, organizations, companies, or individuals that may be interested in being part of the team. Responses Due: RFI responses are due September 15, 2017. Additional information about the Foundry - its history, context, community process, building information and more - is available on the CRA website. Charlie Sullivan of the Cambridge Historical Commission will be providing a presentation on the history of the Foundry at the upcoming Foundry Advisory Committee meeting. 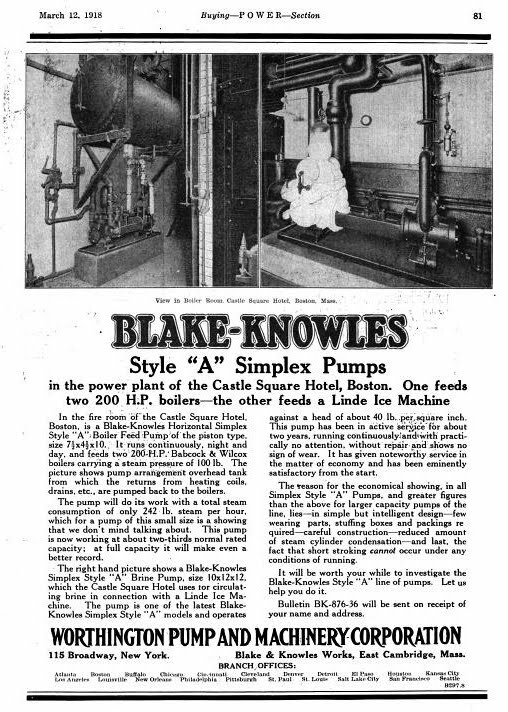 The Foundry was originally the Blake & Knowles Steam Pump Company. 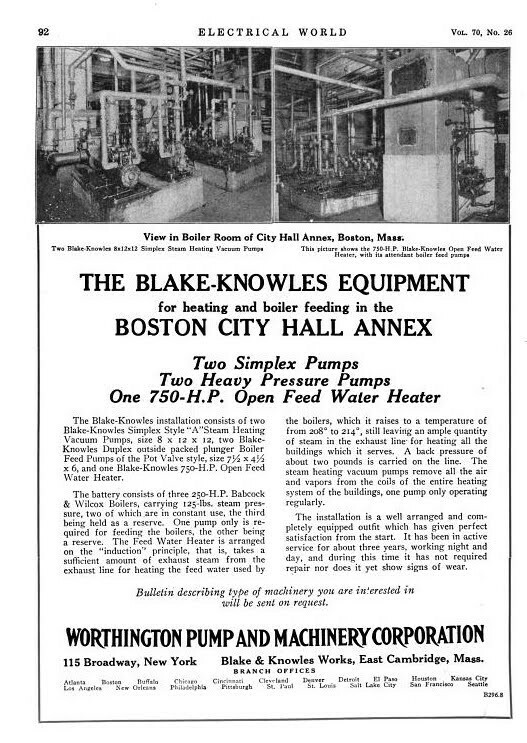 It has been part of East Cambridge since 1886. 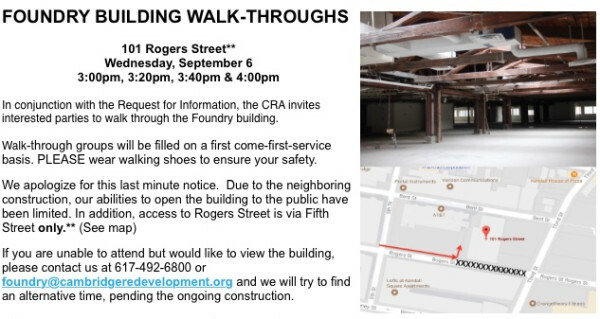 If you are interested in touring the historic Foundry Building, the CRA will be hosting a tour. Please RSVP. Thank you to all that attended the Community Meeting at the Dante Alighieri Cultural Center on May 30th. The input provided by the attendees that commented has been helpful to the City and the CRA during this planning process. The power point that was presented is available to be viewed in the “Info & Plans” section of this site. Please be advised of the upcoming public meetings regarding the Foundry redevelopment. The Foundry Advisory Committee is holding a public meeting. Charlie Sullivan of the Cambridge Historical Commission will provide a presentation on the history of the Foundry. The Neighborhood and Long Term Planning, Public Facilities, Arts and Celebrations Committee have rescheduled the public hearing on the Foundry. The City and the CRA are hosting a community meeting tomorrow night to discuss the Foundry redevelopment. Please join the City Manager and staff from the City and the CRA to learn more about the proposal. Thank you for visiting The Foundry's project page. We're using this platform to help you participate in the Foundry community process, and to keep you updated the latest plans, forums, and upcoming events. Follow the project to receive email notifications about new status updates and visit the Comments section to share your questions, comments, and ideas with us.